Augusta Coating & Manufacturing (ACM) is a full service contract coater of steel, stainless steel, and aluminum parts. ACM specializes in high corrosion and appearance coatings for the transportation, automotive, agricultural, electrical, and recreational and maintenance vehicle markets. 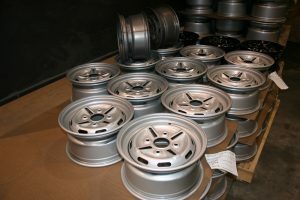 Having high reject rates when coating with metallic powders on extremely challenging parts, ACM realized the need to upgrade their powder coating equipment. The goal was to obtain a reliable and repeatable process which would reduce overall costs and increase flexibility in order to adapt to changing customer requirements. After lab demonstrations from several suppliers, ACM found the only powder coating equipment that met their needs was the OptiFlex™ Automatic Powder Coating system from Gema USA. ACM’s upgrade consisted of OptiGun® automatic powder guns, OptiStar™ control units, OptiFlow™ powder pumps, OptiFlex manual wall units, and an OptiFlex manual box unit. Through the consistent and reliable application of metallic coatings on their challenging part geometries, ACM has recognized numerous benefits from their Gema USA upgrade. ACM has reduced their rework costs and associated employee overtime, decreased throughput time, reduced spare parts usage by 20%, and reduced powder usage by 20%. ACM estimates a payback time under one year for the purchase of the new Gema USA powder coating application equipment.